Breathe…in…out…in…out…breathe. Seems simple doesn’t it? To…just breathe. God made it so our bodies will automatically breathe without our intentional thought…without having to tell ourselves to breathe in and out…to breathe that life-giving breath. In 2002, I was diagnosed with Clinical Depression and PTSD (Post traumatic Stress Disorder) and a Panic Disorder Without Agoraphobia. What this all means is that I have a chemical imbalance in my brain that causes my depression. Also some traumatic event in my life has caused me to endure flashbacks and severe stress which is the PTSD. (This is also a disorder that a lot of military veterans are diagnosed with after coming back from war, and let me just say right now that whatever I have went through in my life will never compare with what our military men have endured.) The third thing, the panic disorder without agoraphobia, means that my body will start to panic or have a panic attack when confronted with certain things in my life. The “without agoraphobia” just means that I can go outside or open spaces without fear or panic. I have a charm bracelet that I cherish very much with all of my interests hanging from it. One of the charms is just a little flat silver oval that says “breathe” and a tiny brown stone hangs from the bottom. Believe it or not, I have had to hold onto this charm to remind myself to breathe. To breathe. To breathe. And admittedly, that tiny little charm has helped me keep a level head, because if you can control your breathing, you can come out of an attack a little easier. One time I was in therapy talking through an extremely bad part of my life with the therapist and I felt like the room was getting smaller. The room was caving in and everything was getting fuzzy and black around the edges. I knew I was panicking and I wanted to run. I had never panicked in front of anyone but my husband before. 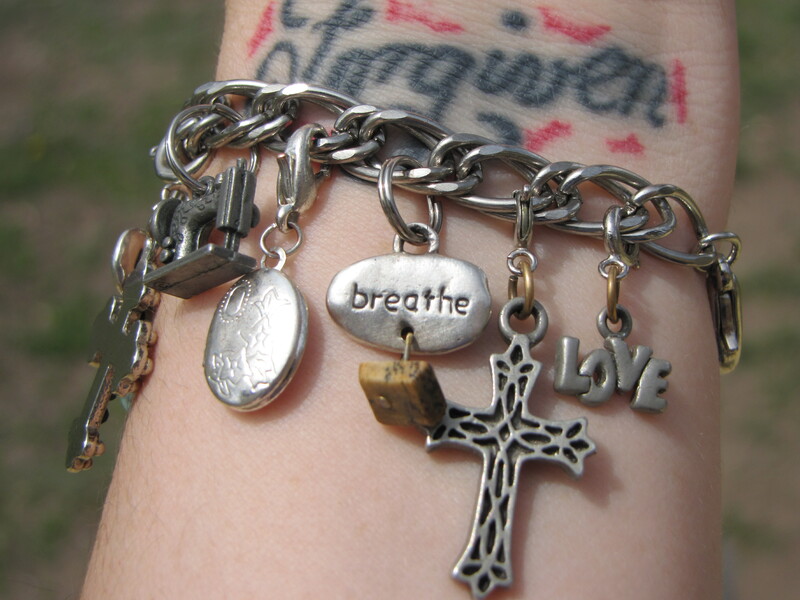 I reached down and grabbed my bracelet charm and just the feel of something solid reminded me to breathe and exhale. The room went back to its original size. I had found something to calm me and I realized that sometimes we do just need a physical reminder to take in oxygen and not hold our breath. The God-given gift of breathing has to have a reminder…ironic isn’t it? But it’s true. To those of us who suffer with anxiety…it’s very true. Fear of Failure. Fear of the Unknown. Fear of Death. Fear of Spiders, Heights, Clowns, etc. Absolutely everyone has some sort of fear. Just by saying this, I know it evokes an imagery in your brain of your worst fear. I could talk about my “fear” of clowns right here (brought on by Stephen King’s IT), but there is something that can and sometimes will be more debilitating than just a fear of a big red nose and gnarly hair. I have a “Wall of Fear”. This “Wall” prevents me from doing numerous activities, projects, etc. I sometimes think that “Wall” prevents me from success. So…what do I mean by this? Well, it’s like me starting my blog. I have so many ideas in my head that are conjured up by only God himself, but I just can’t drive myself to sit down and pound out another page. I hit the “Wall”. I have a fear of the possibility of this getting big, a fear of it not getting big, a fear of saying something I shouldn’t, a fear of saying something I should, and so on and so forth. The Wall. I’ve quit doing some very important projects just because I have run smack dab into that Wall. So…what do you do now? If you have ever suffered from depression, you know that even the most anticipated activities in your life become dreaded and more often than not, something you don’t even show up for because…of your depression. If you continue to do this, your life turns into nothing but a hole…a deep, dark hole. So one of the hardest things we have to do with depression is to…just…go. Do it! Make an effort. Sometimes a huge effort is needed, but nonetheless…make that effort! I have literally had to force myself (or my husband has) to get ready to go somewhere with tears (and fears) and physically pull myself to standing to get going. So…this is what I have to do with the Wall of Fear. Physically, mentally, and yes, spiritually fight through it, over it, or around it…whatever gets me there. Over that wall. The hardest part is starting. The rest gets easier. And sometimes the rest is so enjoyable that you wonder why in the world you allowed something to ever get in your way! Just like the walls of Jericho, the wall will come tumbling down! Thank God! THE WALL will become…the wall. Instead of climbing breathlessly over it, you will be able to just step over it, then you will turn around and see that it truly never was a wall. It was just a stupid stumbling block put there to tear you down one brick at a time.